Leftover eggnog? I'm sure you made your own! If you bought eggnog, I'm sure you checked to see that the main ingredients were milk and/or cream, sugar, and egg yolks. Now think about it; eggnog is just an ice cream base waiting to be frozen. 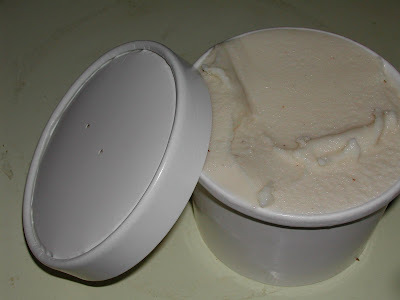 Grab that sad carton out of the refrigerator and pour it into the ice cream maker. If you made your own eggnog and you used quite a bit of alcohol, this will not work as well as the alcohol won't freeze. 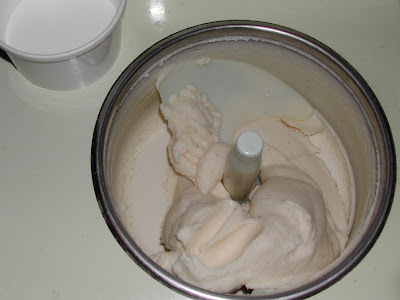 Now that you have eggnog ice cream, lets make a topping. Grab that bit of leftover cranberry sauce and heat it gently. You can add a bit of water if need be. Let the sauce form a nice syrup. 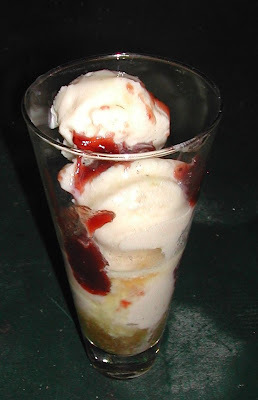 Pour the cranberry syrup over your eggnog ice cream. Now add a shot of cheer. The breakfast speciality at Doe Run Farm is 3B Pancakes (Bisquick, Buttermilk and Bacon). Grab that Bisquick and make pancakes. Sorry, we ate all the pancakes before anyone could get a picture! Add another 1/2 cup of eggnog to the batter and make crepes. Fill them with ice cream or top with your cranberry syrup. Remember, eggnog is just a thin custard. Use it to make rice pudding. Place the currants in a cup and add the bourbon to soak. As you can see, I really buttered the basin! 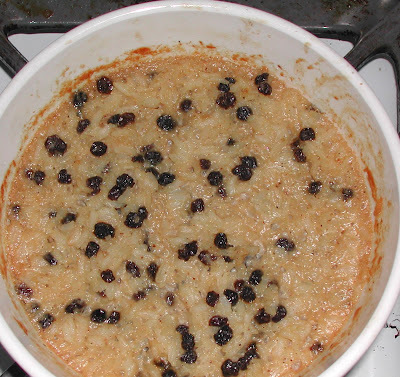 Also, you might notice that I had a few extra currants left in a bag so I used them all, and added extra bourbon to soak them in, so my Eggnog Rice Pudding looked a bit dark. Not to worry. 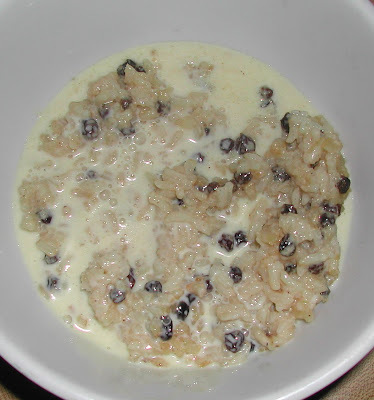 In true English style, I spooned it into a bowl and add a bit more eggnog as a custard. Repeat the rice pudding recipe with stale bread. Grab that basket of stale dinner roles, and rip them into lovely bite-sized pieces. Now, run out to the grocery and buy that eggnog that is on sale. Thanks for this wonderful post. I have never made ice cream before but you have inspired. I love eggnog and will try it with the rice pudding.